Tom Gilbert celebrates after scoring the winning goal in the 2006 NCAA Championship. The Edmonton Oilers have agreed to terms on a two-year contract with defenceman Tom Gilbert. The 63", 210-pound native of Bloomington, Minnesota joins the Oilers following an outstanding four-year career with the University of Wisconsin Badgers. Gilbert was a member of Wisconsins NCAA championship team in 2005-06, scoring the winning goal in the Badgers 2-1 victory over the Boston College Eagles in the Frozen Four championship final. An assistant captain in both his junior and senior years at Wisconsin, the 23-year-old blueliner was named to the NCAA Frozen Four all-tournament team and was also named a second team NCAA West All-American and was a WCHA first team all-conference selection. 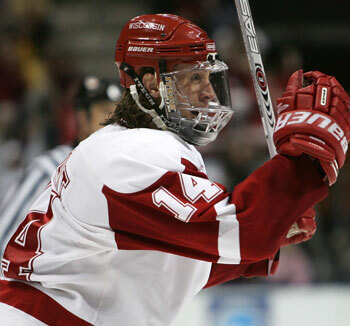 Gilbert finished fourth in scoring on the Badgers in 2005-06 with 12-19-31 in 43 games with 32 penalty minutes. He was fourth in both goals and assists and led Wisconsin in plus/minus with a +28 rating. Six of his 12 goals were scored on the powerplay and he had three game winning goals. The Badgers team MVP in 2004-05, Gilbert scored 33-56-89 with 152 PIM in 162 career games with Wisconsin from 2002-03 to 2005-06. Prior to attending Wisconsin, he played one season with the Chicago Steel of the USHL and two seasons of high school hockey in his hometown with Bloomington Jefferson High School. He was a finalist for Minnesotas Mr. Hockey and was named the male athlete of the year during his senior year in high school (2000-01). Gilbert was obtained by the Oilers from the Colorado Avalanche in exchange for Tommy Salo and Edmontons sixth round choice (Justin Mercier) in the 2005 NHL Entry Draft on March 8, 2004. He was the Avalanches fifth choice, 129th overall, in the 2002 Entry Draft.